Whenever I find a product or a website that I love, it makes me very happy to be able to pass it on to our readers. Shop-Tuile.com sells beautiful and unique jewelry featuring designs from all around the globe. Exquisite rings, necklaces, earrings, bracelets and more are all made with sterling silver, and adorned with semi-precious gemstones. Most collections are exclusive to Shop-Tuile.com and are not available at any department store or boutique. The company works with a variety of designers whose work is known and sold worldwide. Each designer brings a unique collection of jewelry to choose from. There is also a collection of scarves available that are truly luxurious, made from pure silk, cotton or cashmere. Though worn by many Hollywood celebrities, Shop-Tuile.com offers many pieces that are surprisingly affordable. Testimonials from happy customers adds to the joy of your shopping experience and assures you of the highest quality of customer service. 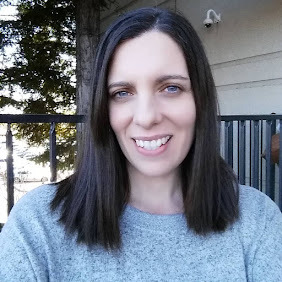 I was sent for review the Casablanca, gold vermeil ball earrings. 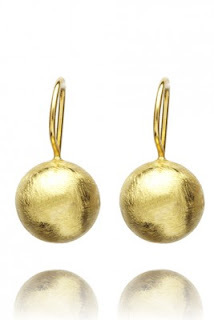 These lovely brushed 14kt yellow gold earrings are perfect for day or night time wear. I really love the simple, classic elegance of these earrings and anticipate wearing them for years to come. 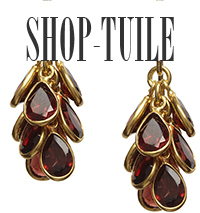 Shop-Tuile.com is a wonderful place to find unique and timeless pieces of jewelry that you will treasure. I am so happy to announce that they are giving away two $50.00 certificates to two of our readers. Go to their website to see the complete line of jewelry and scarves available. *Limited to US residents; 18 years old and above. Giveaway starts February 9 , 2012 and ends on February 20th , 2012 at midnight PST. Winner will be emailed and has 48 hours to respond before another winner is selected. I was not paid for this giveaway or post. The opinions on this item are 100% mine and may vary from others. The sponsor is responsible for providing the prize. My favorite item is the "Amy" earrings. Follow Frugal Family Tree on GFC as ossmcalc. oh man i looooove the Nawait Earrings By Amrapali!! Smoky Quartz gemstone Rock Earring. My favorite item is the Cox Comb Black & White Check Silver Earrings. I like Shop Tuile on Facebook (FB name: Madeline Brubaker). I follow Shop Tuile on Twitter (@shala_darkstone). I sent you a friend request on Facebook (FB name: Madeline Brubaker). Rose Gold Vermeil Hoop Earring is my favorite item. My favorite item is the Hydrangea necklace! I love the Halonen Ring! I like Tuile.com on facebook as Pamela Womack Sims. 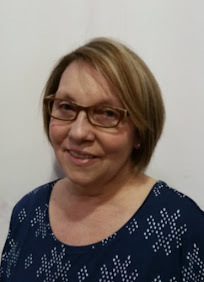 I sent a facebook friend request to Frugal Family Tree as Pamela Womack Sims.